Integrated Imaging began operating in 1986 as a wholesale lab serving one hour photo labs and mini labs in the Rocky Mountain region. Integrated Imaging no longer operates a retail shop in Casper, Wyoming, Local customers should drop off film at Mountain States Lithographing ~ 133 South McKinley Street, Casper, WY 82601. At Integrated Imaging we strive for the best quality, and stay abreast of technological advances that effect the quality of your families treasured memories. 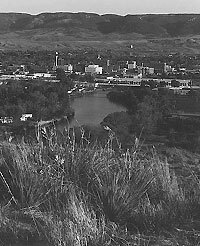 Downtown Casper from the "Casper Events Center" Casper Mountain in the background, North Platte River in the foreground. Excellent job on the film transfer. Thanks!! !